There have been some great comments and links from contributors to their original research here in the last few days. Thank you all. I’m taking my fiancee away for the long bank holiday weekend to celebrate our engagement. Please continue to post your additional comments to existing threads, and get something interesting going on this open thread. I look forward to catching up on our return. New visitors please note: If you haven’t had a comment approved before, it will be held for moderation. Thanks. I am lucky to have such great contributions from my regular visitors. I’m trying to get te parameters right for my investigation of the relationship between planetary alignments and solar activity To help get a handle on changes in solar activity, visualisation of the data is all important. Tim C and M Vukcevic have come up with the goods. I hope Vuk will tell us more about the formula he has developed which relates to planetary motion and encapsulates the north-south dominant periods. He says the ‘lump’ slowly rotates on a decadal scale. What causes that?? People following this blog closely will know that Roy Martin’s excellent analysis of the tidal relationship of Jupiter, Earth and Venus alignments with the solar cycle has led me to test the possible electro-magnetic relationship using a modified copy of his original database, which he very kindly sent me earlier this week. The initial result was interesting, but still had the divergences in timings between the alignment cycles and the solar cycles. 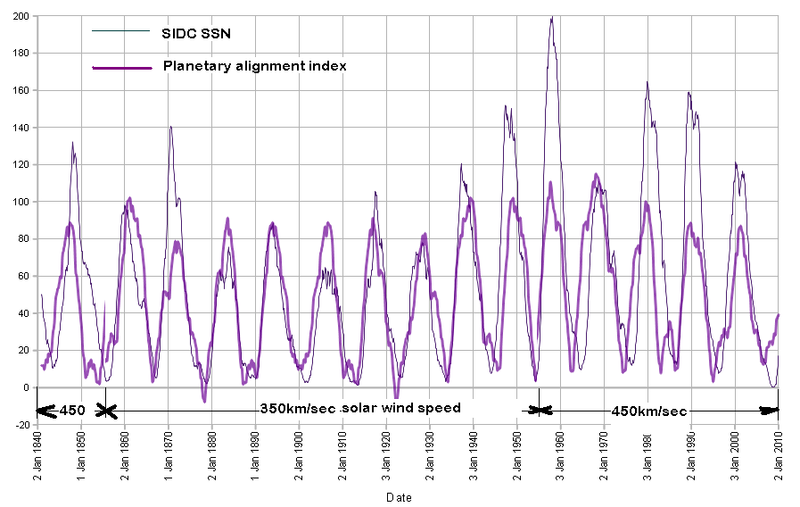 I still need to find a good reconstruction of solar windspeed variation over the period of record under test which I can integrate into the database, but in the meantime, I have done a quick and dirty engineers approximation to test my hypothesis that the relationship is partly electromagnetic as well as tidal. Both are operative. I realised that if the relationship is partly electro-magnetic, this would mean the alignments of the planets along the curve of the interplanetary magnetic field needed to be checked, in addition to the gravitational/tidal alignments in straight radial lines from the sun already covered by Roy’s analysis. This is because according to NASA, the flux tubes and magnetic ‘ropes’ which reconnect with the planetary magnetospheres are embedded in the stream of radiation emanating from the Sun. 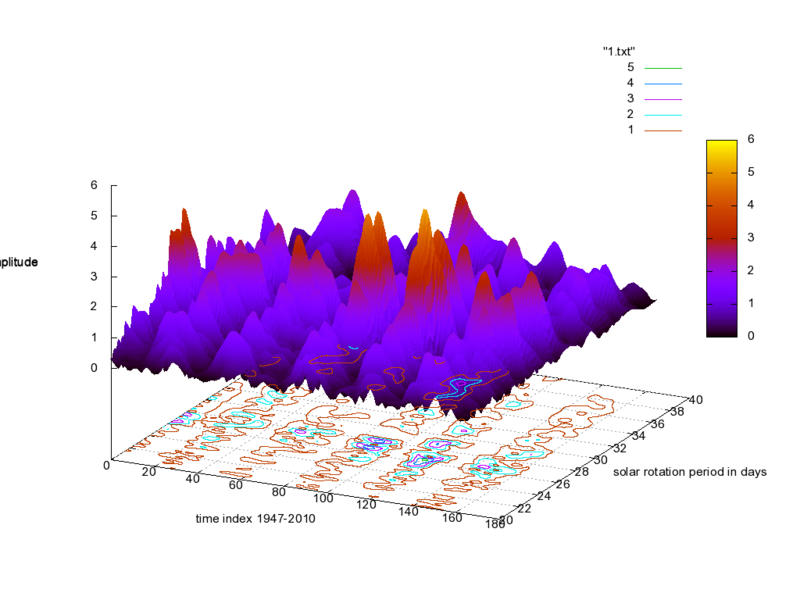 I realised after I made this plot, that the rotation rate for the sun I used wasn’t correct. When corrected, that will improve the correlation further, when I integrate a time series of solar wind speed variation which has a higher average during the late C19th, early C20th, than the 350km/sec I tested. 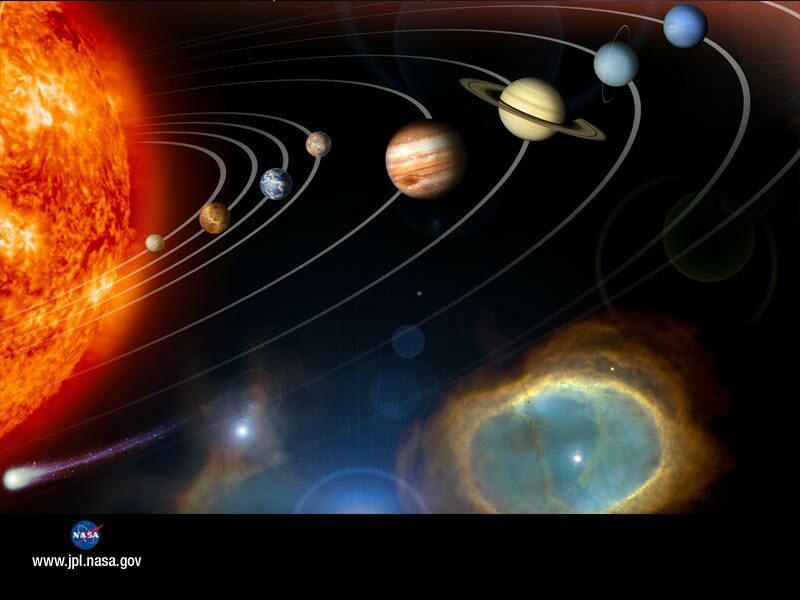 I believe this represents a major step forward for the solar planetary theory and strengthens the case for the hypothesis that the motion of planets in the solar system has a strong modulating effect on the solar cycle. New research suggests that the longer-than-expected period of weak activity may have been linked to changes in the way a hot soup of charged particles called plasma circulated in the Sun. The new research suggests that one reason for the prolonged period of weak activity could be changes in the Sun’s “conveyor belt”. Similar to the Earth’s ocean currents, the Sun’s conveyor transports plasma across its surface to the pole. Here, the plasma sinks into the heart of the Sun before rising again at the equator. During the 23rd cycle, these currents of fire extended all the way to the poles, while in earlier cycles they only extended about two thirds of the way. Dr Roger Ulrich of the University of California, Los Angeles, a co-author of the study, said the findings highlighted the importance of our monitoring of the Sun. The research team used sophisticated computer simulations to show how changes in the conveyor might have affected cycle duration. They found that the increased length of the conveyor and its slower rate of return flow explained the prolonged 23rd cycle. However, Dr David Hathaway, a solar physicist from Nasa’s Marshall Space Flight Center in Alabama, who was not involved in the latest study, argued that it was the speed and not the extent of the conveyor that was of real importance. Read the rest on the BBC website here. Should the sun’s role in weather and climate be re-assessed? The idea that changes in solar activity can affect our weather and climate has very much fallen out of fashion in recent times. Most climate scientists’ efforts have been directed towards the impact of greenhouse gases on global temperatures, and what a warmer planet could mean to weather and climate. Most, but not all, meteorologists dismiss the idea that the sun could play an important role in determining our weather, and hence climate. This may, at least in part, be down to the fact that forecasts these days are heavily reliant on powerful supercomputers that can’t incorporate the influence of the sun, simply because the precise mechanism of how the sun impacts our weather is either not understood, or impossible to model. 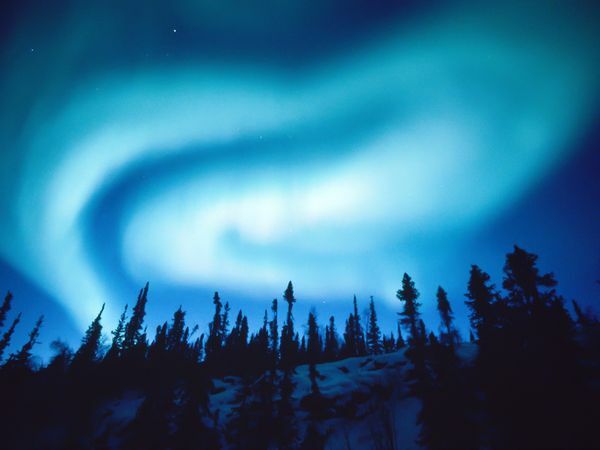 But it wasn’t that long ago that eminent climatologists such as Professor Lamb at the University of East Anglia conducted research which showed, amongst other things, a link between low solar activity and pressure patterns over Greenland. In his day forensic analysis of weather data was the only way to forecast the weather, but sadly much of his work, and work like it, has been mostly forgotton, as the weather industry becomes more and more reliant on computer simulations of the atmosphere. But it seems that it may becoming a fashionable area of research once more. copyright 2009 Contact author for permission to republish. 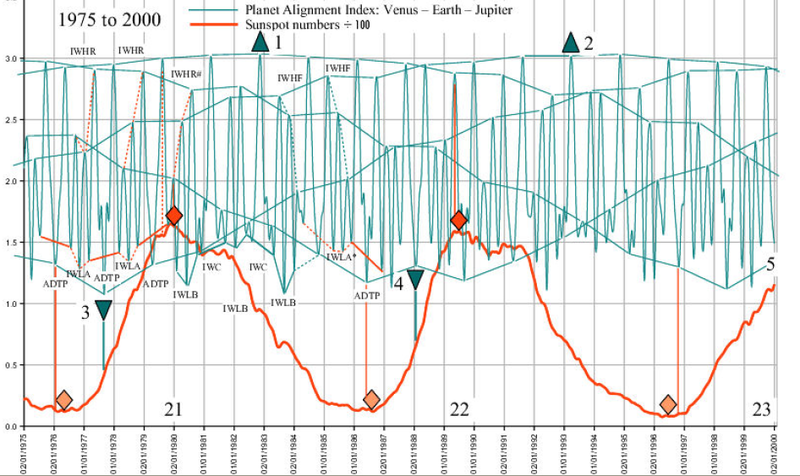 alignment index representing the tidal influence of the planets Venus, Earth and Jupiter on the sun. factor in the formation of many observed solar events. Update:Graph for 1650-1675 added for comparison. Observations from long term plots. cause and effect relationship with solar activity because the phase difference is sometimes lagging. 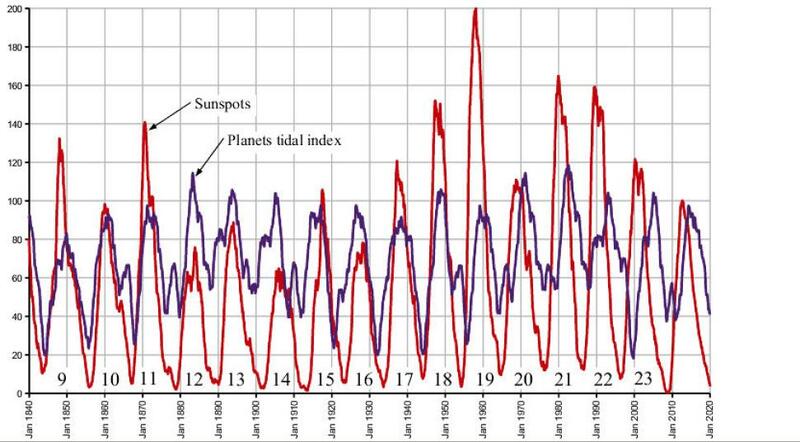 accepted that tidal influences of the planets cause variations in solar activity. Construction of shorter term plots. level of 1.5 the SPMs relate to low rather than high points within the pattern of SPs. Roy is too involved with other matters to join discussion at present, but I’m putting this post up for open review so we can work out some pertinent questions for Roy when he gets the chance to call by. 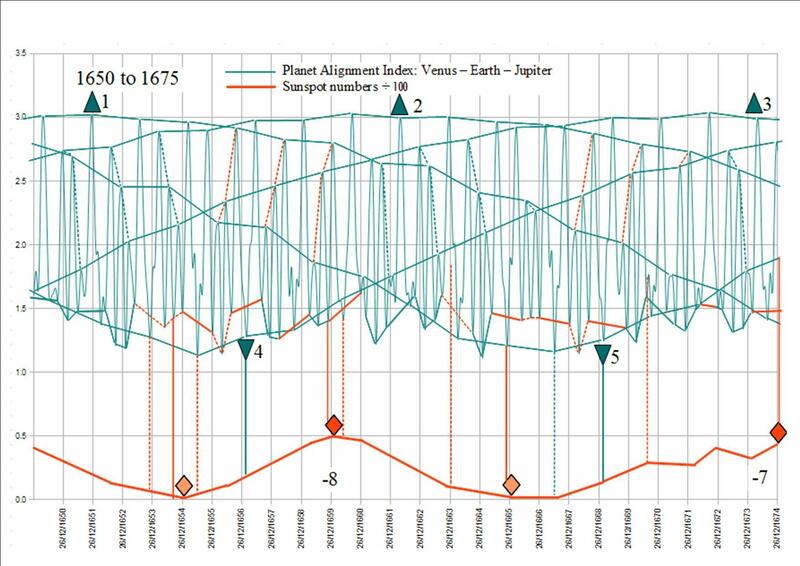 My first observations are that the way Roy’s analysis shows the planetary alignments relating to small changes such as secondary peaks on the downslope of the solar cycles put the link between the production of sunspots and the motion of the planets beyond doubt.The ‘moving out of phase’ at the modern end of this graph last happened around the 1780’s, followed a couple of cycles later by a big drop in solar activity and the low cycles of the Dalton Minimum. This can be clearly seen in Jean Pierre Desmoulin’s graph. 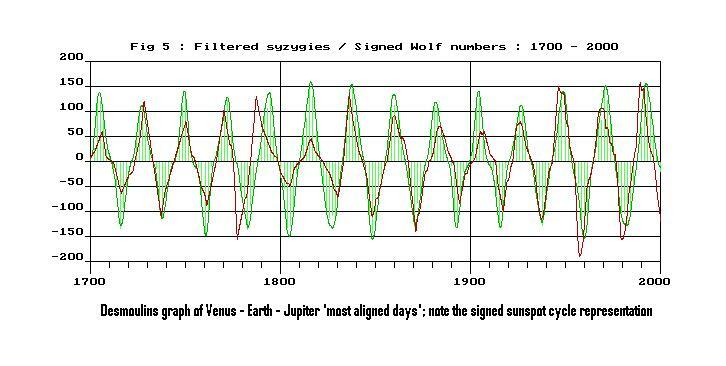 Roy’s speculative curve for Solar cycle 24 may be overestimated taking this into account. What the mechanism is; tidal, electromagnetic, or direct gravitation/angular momentum, is still open for discovery. I’m convinced there is something more than coincidental covariance going on here. I have a couple of ideas how the correlation may be improved even further, but I’ll keep my powder dry until we’ve had some discussion, this is Roy’s moment not mine. Update: I have replaced the graph with this better calibrated one. There is still an unresolved vertical shift of around 0.3%. I think the ‘y’ axis scale on the leftmost graph has a two orders of magnitude error in it too, it should be 100 times bigger numbers. 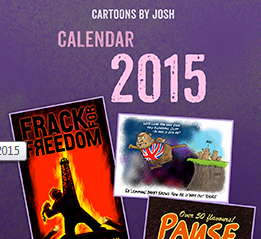 Such are the vagueries of the skepticalscience.com warmies blog. Palle et al have been measuring the amount of Earthlight reflected onto the moon as a method of determining the albedo. ISSCP is meteosat data collated and calibrated by a dedicated team. CERES is a single satellite in a low orbit. Since sunspot numbers don’t correlate so well as this with temperature, it raises the question of what it is which controls specific humidity in the atmosphere. 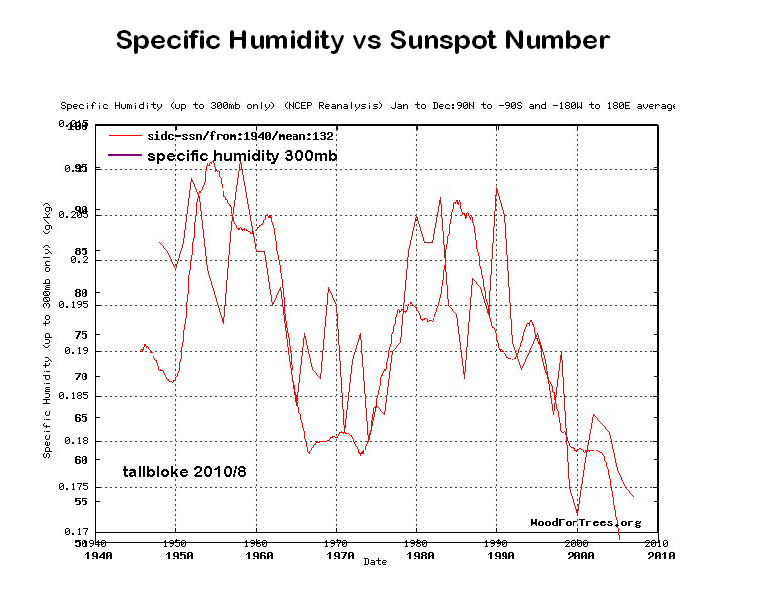 How might the solar flux be affecting humidity? Specific humidity is the ratio of water vapor to air (including water vapor and dry air) in a particular mass. Specific humidity ratio is expressed as a ratio of kilograms of water vapor, mw, per kilogram of total moist air mt . Update: The correlation looks even stronger with the sunspot numbers smoothed at the length of the Earth-Venus cycle, 96 months. It also looks strong at around 82 months, half the length of the Jupiter-Uranus synodic period which coincides with flooding events, as noted by Ulric Lyons in comments. 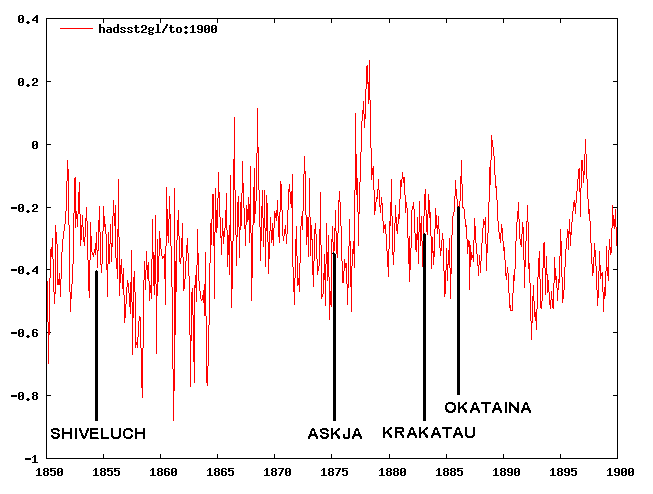 I have been waiting for someone to properly critique Ferenc Miskolczi’s papers on the greenhouse effect. Who better than Dr Roy Spencer? I hope Ferenc Miskolczi will respond. If this statement was true, then IR radiative transfers cannot change the temperature of anything, and Earth’s natural greenhouse effect cannot exist. Yet, elsewhere he implies that the greenhouse effect IS important to temperature by claiming that the greenhouse effect stays constant with time. The reader is left confused. His italicized statement, above, is an extreme generalization of Kirchoffs Law of Radiation, where he has allowed the 2 bodies to have different temperatures, and also allow any amount of extra energy of any type to enter or leave the 2-body system. No matter what else is going on, Miskolczi claims there is no net radiative energy exchanges between two objects, because those 2 flows in opposite directions are always equal. This appears to fly in the face of people’s real world experiences. Nevertheless, Miskolczi’s (and previous investigators’) calculations of a NEAR-equality of these IR flows are quite correct, and are indeed consistent with current greenhouse theory. Others trying to understand this issue need to understand that greenhouse theory already “knows” these flows are almost equal. If the imbalance between them was not small, then the temperature changes we see in nature would be much larger than what we do see. But it is their small departure from equality that makes all the difference. Saturday morning (US time), Dave Smith (brother of the late Carl Vale Smith) will present “An Introduction to Electric Universe Theory,” in conjunction with the Natural Philosophy Alliance. Dave is the managing editor of the Thunderblog page at Thunderbolts.info and has facilitated extensive liaison with scientists and others interested in the Electric Universe hypothesis. The presentation will last two hours and will include plenty of time for questions and answers. There are no special requirements or downloads needed to attend the conference, which is free and open to all. A live “chat” (keyboard style) will run concurrently with the presentation, and all attendees can use this function to pose questions or offer comments. Those who have headsets with a microphone will be able to speak directly to both the presenter and audience during the Q&A phase. Roy Clark phd has spent the last three years researching and writing this paper. It confirms my own research on the average sunspot number and the ocean equilibrium value, as well as extending my thoughts on the multi-decadal retention of heat energy in the worlds oceans into properly quantified analysis. This has enabled Roy to make much more detailed and definite statements about the relative importance of co2 in the atmosphere as an agent of climate change than I could. The paper is pay for, but at least the journal (Energy and Environment) has been consistently open minded about reviewing and publishing those scientists whose research findings are sometimes at odds with the so called mainstream consensus on this issue. The paper runs to 30 pages with many graphs and digrams and represents much better value and more bang for your buck than any other published paper on the subject I know of. A version of the CA climate article should be published on the SSPI (Science and Public Policy Institute) website quite soon and I will revisit this paper after that has gone online. Energy transfer at the Earth’s surface is examined from first principles. 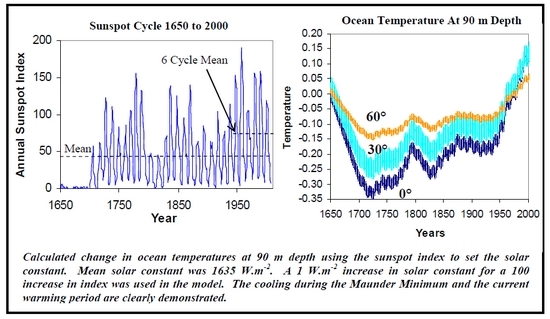 The effects on surface temperature of small changes in the solar constant caused by the sunspot cycle and small increases in downward long wave infrared (LWIR) flux due to a 100 ppm increase in atmospheric CO2 concentration are considered in detail. 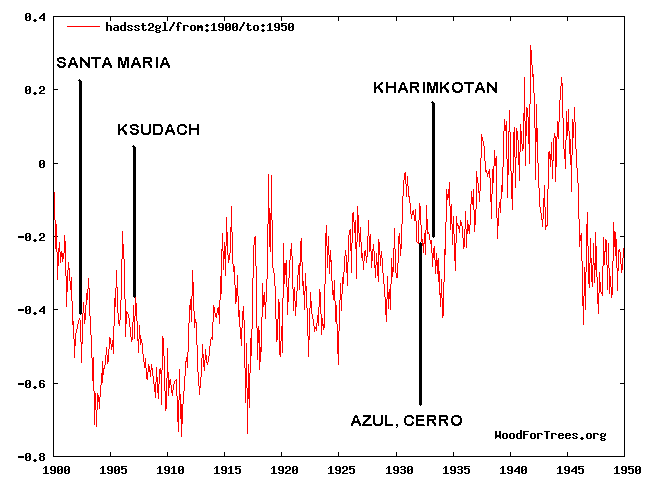 The changes in the solar constant are sufficient to change ocean temperatures and alter the Earth’s climate. 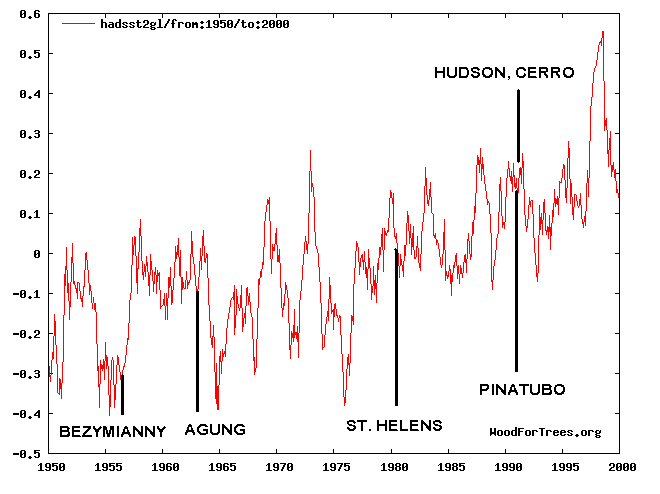 The surface temperature changes produced by an increase in downward LWIR flux are too small to be measured and cannot cause climate change. The assumptions underlying the use of radiative forcing in climate models are shown to be invalid. A null hypothesis for CO2 is proposed that it is impossible to show that changes in CO2 concentration have caused any climate change, at least since the current composition of the atmosphere was set by ocean photosynthesis about one billion years ago. Twenty two years ago while studying for my degree in the history and philosophy of science I attended a lecture by the Astronomer Royale at my home town university. He told us that cosmology was on a firm footing, and that now they had quantified black holes and dark matter, complete understanding was just around the corner and they were just mopping up the last few details. 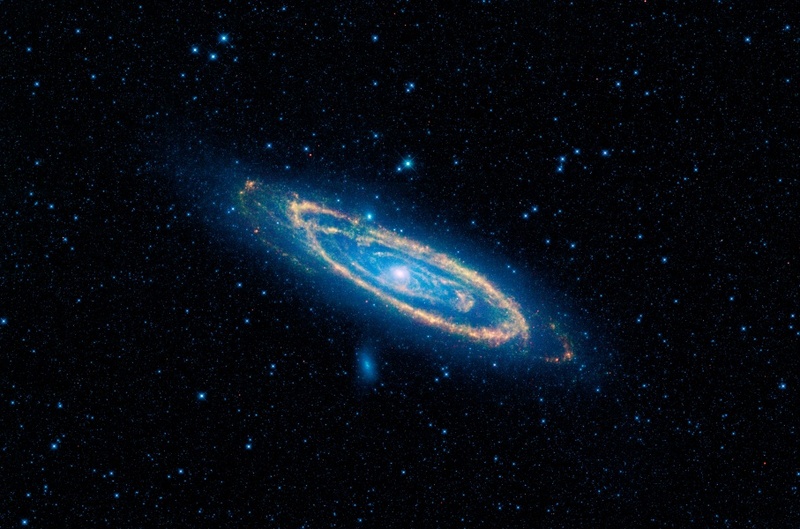 Ever since, I’ve been unsurprised to find that new and better telescopes and computers have brought astronomers and cosmologists and astrophysicists an endless stream of “surprises” to upset their apple cart. Having realised that the Hubble ‘constant’ had been changed on a regular basis to save the big bang theory, I came to the conclusion that redshift didn’t mean what cosmologist thought it did, and that it was perfectly possible the speed of light had changed over the course of the history of the universe. By suggesting that mass, time, and length can be converted into one another as the universe evolves, Wun-Yi Shu has proposed a new class of cosmological models that may fit observations of the universe better than the current big bang model. What this means specifically is that the new models might explain the increasing acceleration of the universe without relying on a cosmological constant such as dark energy, as well as solve or eliminate other cosmological dilemmas such as the flatness problem and the horizon problem. Regular ‘Dirk H’ has alerted me to this report warning of an incoming Coronal Mass Ejection due to arrive tomorrow, 3rd August 2010. This has been picked up by the Solar and Heliospheric Observatory (SOHO) and the Solar Dynamics Observatory (SDO), the new ‘eye on the sun’ launched a couple of months ago and covered on this blog. The eruption happened at around 0855 UT (3:55 am EST), when the SDO detected a C3-class solar flare originating from a cluster of sunspots (called sunspot 1092). 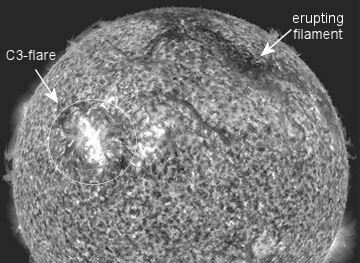 This isn’t a large flare, but right at the same time, a filament located about 100,000 kilometers from the flare also erupted. See the video. Tomorrow evening, people in higher latitudes should get out for a walk to a spot with a clear view towards the nearest pole. You might be rewarded with some spectacular views.